Available on Blu-ray (TM), DVD and OnDemand September 9th! BEVERLY HILLS, CA - Get ready for thrills clocked at 150 MPH when Anchor Bay Entertainment presents the high-octane race car spectacular, Born to Race: Fast Track , on Blu-ray(TM), DVD, OnDemand and Digital Download. Born to Race: Fast Track is the inspiring, thrilling second film in the Born to Race franchise. The fast-paced, high-octane racing action is even more exciting and compelling, putting the audience behind the wheel and on the track! Fans of Born to Race and newcomers to the franchise will be thrilled with the exciting action of Fast Track as well as its heart. Featuring "old-school" filmed-in-real-time, non-CGI enhanced race sequences, Born to Race: Fast Track crosses the finish line starting August 29th when it's available for digital download on iTunes. It's available on Blu-ray(TM), DVD and OnDemand September 9th. SRP is $26.99 for the Blu-ray(TM) and $22.98 for the DVD, with pre-book on August 6th. Survival of the Fastest. Brett Davern and Beau Mirchoff of MTV's "Awkward" star as Danny and Jake, small-town street-racing rivals with fast cars and bad tempers. When Danny scores a summer scholarship to a top racing school, he'll find himself in fierce competition with an international class of drivers, in an illicit relationship with a new peer (Tiffany Dupont of "Greek"), and reluctantly teamed with his old nemesis Jake. To win big on this track, survival of the fastest is the only rule that matters. Diogo Morgado ("The Messenger," "The Bible"), Corbin Bernsen ("Psych," "L.A. Law"), Grant Show ("Devious Maids," "Melrose Place") and Sharon Lawrence ("Rizzoli & Isles") co-star in this inspiring and thrilling second film in the Born to Race franchise. 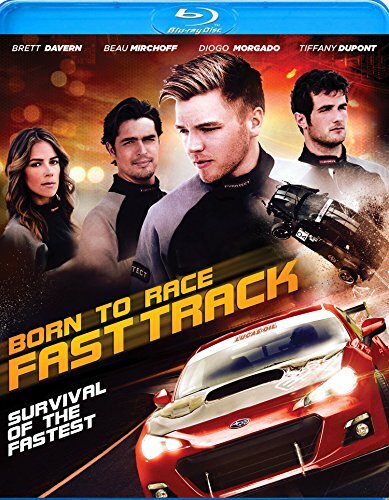 The creative team behind the first Born To Race -- director Alex Ranarivelo, screenwriter Steve Sarno, and producer (and professional race car driver) Ali Afshar -- have returned to make Born To Face: Fast Track an unforgettable excursion into the world of rookie race car drivers.